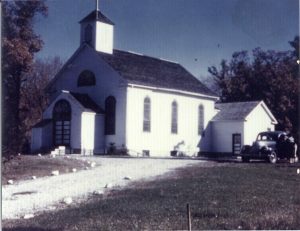 St. Patrick Catholic Church, established in 1871 and home of 40 Irish immigrant families, was located south and west of the current church, on what is now known as County Road 58. At that time, Church of St. Patrick of Cedar Creek was a mission church of St. Stephen in Anoka. In 1872 a festival was held at Cedar Creek to help pay expenses incurred in this building, which was the start of what we currently refer to as “CountryFest,” our annual parish festival. When the country church could no longer hold our rapidly expanding community, it was decided to relocate the parish to a place where it could continue to grow. In 1971 Anna Collins, an active, loyal parishioner, together with her husband, Irving Collins, donated a portion of the Collins family farm to St. Patrick Catholic Church. 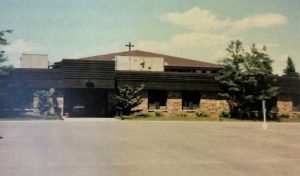 Under the leadership of Father John Donahue, a new Church and education wing were constructed in 1976. A new era for St. Patrick Catholic Church began with a new church and 560 families registered. Father Donahue had an amiable style and deep spirituality that reached out to both young and old parishioners and in the nine years he was pastor, our parish increased by nearly threefold. In 1977 the Rectory was built by parish volunteers, whom felt strongly that Father John Donahue should have a home of his own. Anna and Irv would once again be generous to the people of St. Patrick Catholic Church and donated the land that would become our St. Patrick’s cemetery. In mid-1985, under Father Bauer’s pastorate, the cemetery was built. St Patrick’s cemetery has a capacity of roughly 1500 graves. A second wave of rampant growth occurred in the late half of the 1990’s. From 950 families in1987, the number of households had grown to 1530 by 1997. In the late 1990’s under the leadership of Father Michael Kennedy, discussions began on the need for more space. 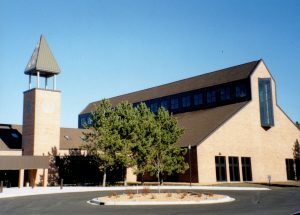 Construction began in 2000 on a large addition to the east, which is now the present Church and Gather Area. Our present church was dedicated on November 18, 2001. For those St. Patrick’s old timers who remembered building the current church, it was deja vu all over again! In August 2004, Father Rick Banker joined our community as pastor. Father Banker eventually felt called to another parish and stayed until the end of 2005. During Father Rick’s pastorate, one of his greatest contributions to our church facility was to oversee the financial donations and commission of the beautiful, hand-carved Italian crucifix which now enjoys a permanent place in our Sanctuary. In May 2006, Father David Blume was appointed to St Patrick Catholic Church, his background was in the financial and accounting aspects of business. Since the parish had amassed a good deal of debt, Father David Blume provided the parish financial and spiritual direction. During his time, a Perpetual Adoration Chapel was commissioned, and emphasis was put on Youth Formation programs. St Patrick has reduced the overall debt for the 2001 addition from $7.1 million to a projected balance of $3.9 on June 30, 2015. On July 1, 2015, Father Allan Paul Eilen was welcomed to St. Patrick Catholic Church as our new Pastor. After high school he received his Bachelor’s degree in Biology from the College of St. Thomas. Father Eilen then spent nearly 20 years in the courier industry, most notably with the HealthEast Care System as manager of its Courier Division. As Father Eilen knows, God was slowly speaking to his heart during all those years. In 2003, he was accepted to St. Paul Seminary and ordained a priest in 2009. In July, 2015, under Dan Jaeger’s administration, we kicked off our Vision 2020 long range planning to set a course for the future. One of Father Eilen’s goals at St. Patrick’s is based on meeting people where they’re at, and walking with them in their spiritual journey. He said – Our mission statement is to “love God, neighbor and self.” We are thrilled to be part of this mission and vision. St Patrick Catholic Church has a beautiful campus, but that’s not who we are. Not at all. St. Patrick’s is a community above all, and as such there are three things we do. First, we serve God. Next, we serve each other, and third, we have fun doing it! At this point, the Community of St. Patrick Catholic Church has roughly 2,100 family members. Volunteers make things happen at St Patrick’s. They bring Christ’s Love to everyone they help, even if the recipient doesn’t notice. Jesus has assured us, “Whatsoever you do for the least of my brothers, that you do onto Me.” (Matthew 25:40) So whether a volunteer is shoveling snow, or decorating the church for Easter, or teaching catechism classes, or packing meals for the homeless, each person and each act manifests Christ to the world.